Judge Brett Kavanaugh (L) smiles prior to a meeting with Sen. Benjamin Sasse (R-NE) in the Russell Senate Office Building on July 12, 2018 in Washington, DC. 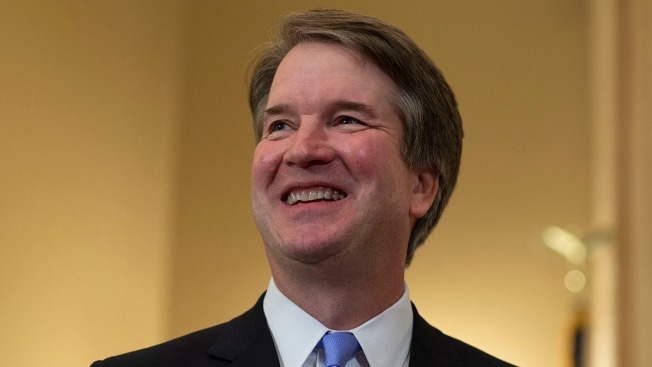 Two years before President Donald Trump nominated him to a seat on the Supreme Court, federal appeals courts Judge Brett Kavanaugh said he believes the legal precedent that allows for independent counsels to investigate government officials for federal crimes should be overturned, NBC News reports. When asked about cases he believes should be overturned, Kavanaugh cited Morrison v. Olson, a Supreme Court ruling upholding a 1978 law that creates a system for independent counsels to investigate and potentially prosecute government officials for federal crimes. Kavanaugh was quoted as saying "It's been effectively overruled, but I would put the final nail in" at an event for conservative think tank American Enterprise Institute. After the law expired, new regulations allowed for the appointment of "special counsels," but unlike independent counsels, special counsels answer to the U.S. attorney general. The president's campaign is under investigation by a special counsel, Robert Mueller, as part of the ongoing federal probe into Russian interference in the 2016 U.S. election. CORRECTION (July 28, 2018, 3:43 p.m. ET): A headline on an earlier version of this story mischaracterized Kavanaugh's comments. He was talking about the legal precedent that allows for independent counsels.